As I mentioned yesterday, I have recently spent some time playing with my new Brother overlock machine. Yesterday I serged a few of my first rolled hems. A rolled hem is a beautiful thing. It is such a neat and tidy way to take care of raw edges. You can easily find the settings for rolled hems in your serger handbook. It took me a little while to get used to removing needles, and stitch fingers, but I'm sure that in no time it will be as easy to prepare rolled hem settings as it is to thread a needle on the sewing machine. I thought that I'd devote todays post to rolled hems and narrow rolled hems. A rolled hem can be created using a standard sewing machine, but the equipment is a little different, and the end result is a bit more polished. Both types of sewing machines can create quite impressive results. A rolled hem is created when the right side of the fabric is rolled back toward the wrong side of the fabric, and stitched in place. With an overlock machine, the upper and lower looper threads secure the fabric by looping around the rolled edge. The tension on the lower looper thread is greater than that of the upper, causing the fabric to pull toward the wrong side. Often times you will see different variations of rolled hems on shirts, table linens, cloth napkins, bed linens, and sheer fabrics such as skirts and scarves. There are a number of different applications, but an overlocked rolled hem is particularly useful when finishing off knit and woven fabrics. 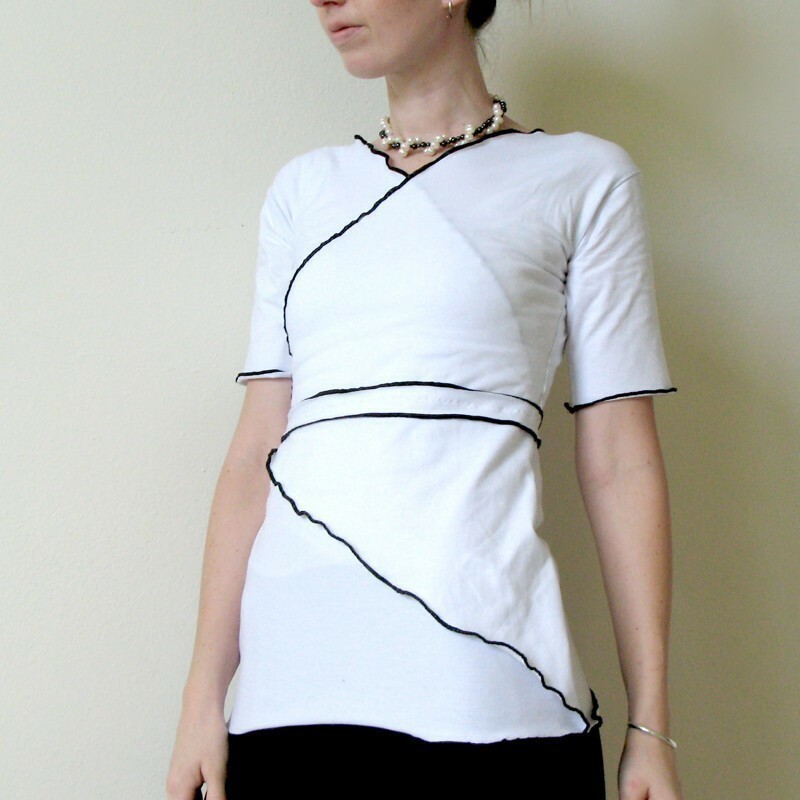 One example of a rolled serged hem is on this Sensei Top by Jodell, of Modest Maven. For tips on serging a rolled hem, read this article from Sew Inspired. When a rolled hem is created on a standard sewing machine, the right side of the fabric is rolled toward the wrong side of the fabric, and a straight stitch secures the roll in place. For information on creating a narrow rolled hem with a standard machine and presser foot, see this article from Crochet n'crafts. I used this technique when creating my circle skirt. A standard rolled hem can be done by hand. See this article from Colette Patterns for more information. The easiest way to create a rolled hem, is with a rolled hem presser foot. I first came in contact with this foot when I took my one and only sewing class in college. It is quite a useful foot that I wish I had in my collection. 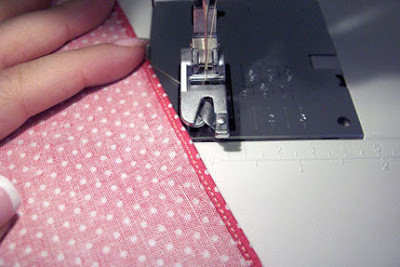 A flange on the front of the foot, and a groove on the back, help roll the fabric as it feeds through your sewing machine. The needle secures the fabric as it feeds. It's a beautiful thing. This is a great video from Sew Etcetera. 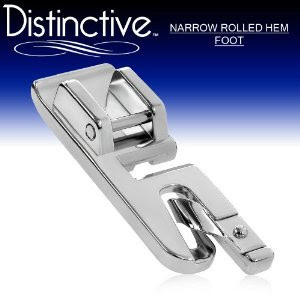 You can procure your own rolled hem presser foot just about anywhere. I found this one on amazon. As I understand it, rolled hem presser feet can are available for different width of hems. Narrow rolled hems, are often seen on skirts, blouses, and linens. A little trick for doing rolled hems on light-weight fabrics (chiffons, organzas, really light weight cotton, and even some medium weight cotton too, etc. ): Use "wooly nylon" thread. The thread when it's unraveled kind of... poofs out, but when it's pulled tight (like wound around the cone, or when used for serging rolled hems) is all smooth. When you use it to do rolled hems it makes a beautiful, smooth, tight rolled hem that somehow looks better than using regular thread on light-weight fabrics. I hope you're enjoying your serger!! Thank you so much for the links! I am trying to actually learn real techniques and terminology, so I am loving this new segment! I love my rolled hem foot! I haven't tried playing with rolled hems on my serger yet. Do you need a special foot for it?